Not surprisingly, Whitman’s approach to distribution was unique and somewhat contradictory. 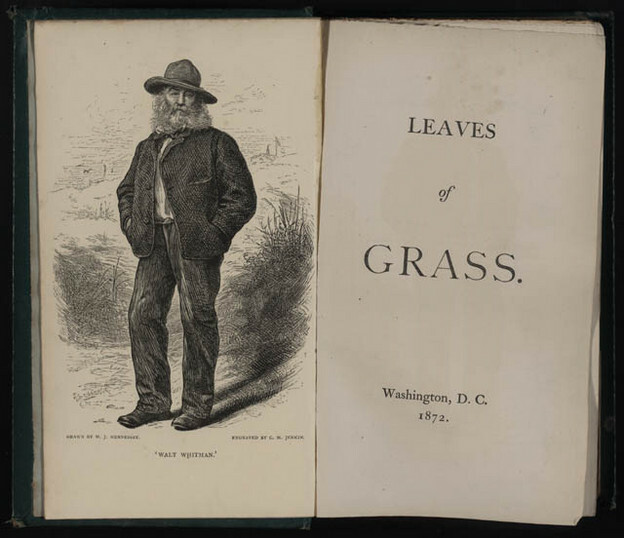 He worked hard to reach audiences near and far by seeking publication in mass-circulation newspapers and magazines.e took great interest in the physical appearance of successive editions of Leaves of Grass and often involved himself in decisions about type, paper, binding, and margin size (not always being mindful of the cost). After 1851, having taken advantage of more affordable mailing prices, Whitman also began to draw a part of his income from direct sales, of which he kept detailed records in his daybooks; Cohen provides fascinating charts that document Whitman’s sales organized by year, region, and title. But the sale of a copy was never the end point in the personal relationship Whitman hoped to forge with his readers. As Cohen argues, “For Whitman, the literal drifting of his work, its finding the right readers through not just commercial but intimate and seemingly random pathways, was as important as the transcendent ‘drift’ of meaning that left print and even words behind in the name of human connection.” Thus, when preparing some of his editions for print, Whitman insisted that they be portable, cheap, and even free, so that they “reach the workmen direct.” At the end of his life, after he had achieved a degree of celebrity, he didn’t think it beneath him to sell copies of his latest works to visitors to his house in Camden, New Jersey. The book itself, the words it contained, the meanings those words conveyed, and the hope for human connection were equally important to Whitman’s idea of distribution. Other examples of drift or “intimate or unpredictable forms of textual mobility” include accounts of Whitman’s readership in the American South where, as another chart indicates, his sales were never as substantial as in the North and the UK, as well as among Native Americans. In both instances, Cohen traces reception histories of Whitman’s poems based on recorded testimonies of particular individuals. The final chapter offers a “behind-the-scenes” look at the digital Walt Whitman Archive, which Cohen helps edit. Gathering published works, manuscripts and letters, image and audio files, scholarly essays and translations, etc., the archive significantly expands the meaning of distribution of Whitman’s oeuvre in our time and into the future. Cohen’s book — and the notion of “drift” it elucidates — offers a useful model for understanding what it means for poems to move around in the world. It suggests that the relationship between author and reader is a kind of encounter that is prearranged yet also leaves much to chance. As Whitman put it in one of his later poems, “[t]he words of my book nothing, the drift of it every thing.” In my next post, I will look at variations of this model developed in a different country and a different century.